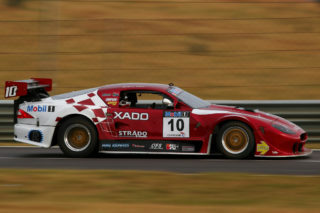 Great spectacle, good weather and a large crowd typified round two of the 2019 Extreme Festival at the Zwartkops Raceway on Saturday. 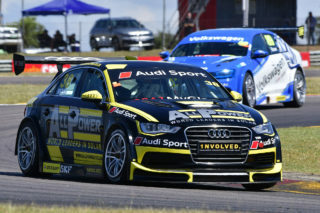 Simon Moss (All Power Audi) won Saturday’s opening race for Global Touring Cars at Zwartkops. Picture: Dave Ledbitter. Officially, the day’s premier status belonged to the Global Touring Car contingent. 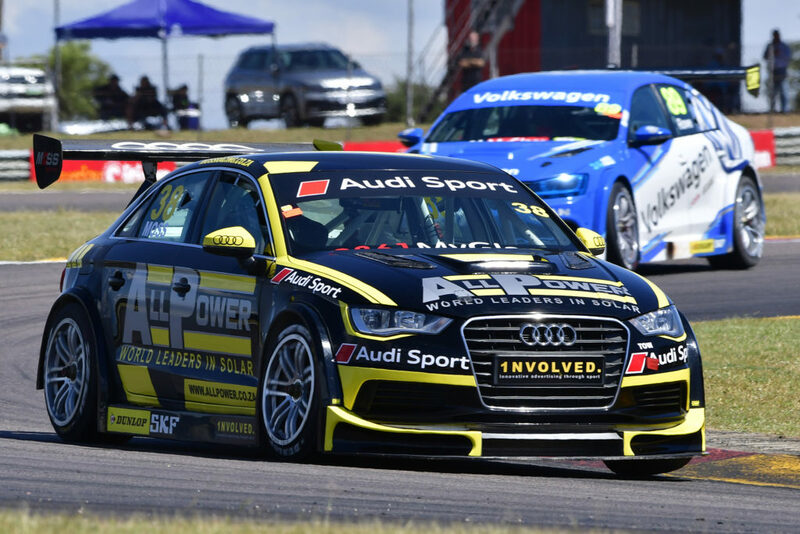 The first race went to Simon Moss (All Power Audi), ahead of Daniel Rowe (Volkswagen Motorsport Jetta), Keagan Masters (Volkswagen Motorsport Jetta), Tschops Sipuka (All Power Audi), Michael van Rooyen (Gazoo Toyota Corolla) and Johan Fourie (EPS Couriers BMW). Race two saw the cars of Rowe and Moss try to claim the same piece of tarmac on the first lap, leaving Rowe’s VW stranded in a sand trap. Then Moss, suffering a broken steering rack due to the collision, slammed his Audi into a tyre wall. The race was red flagged. 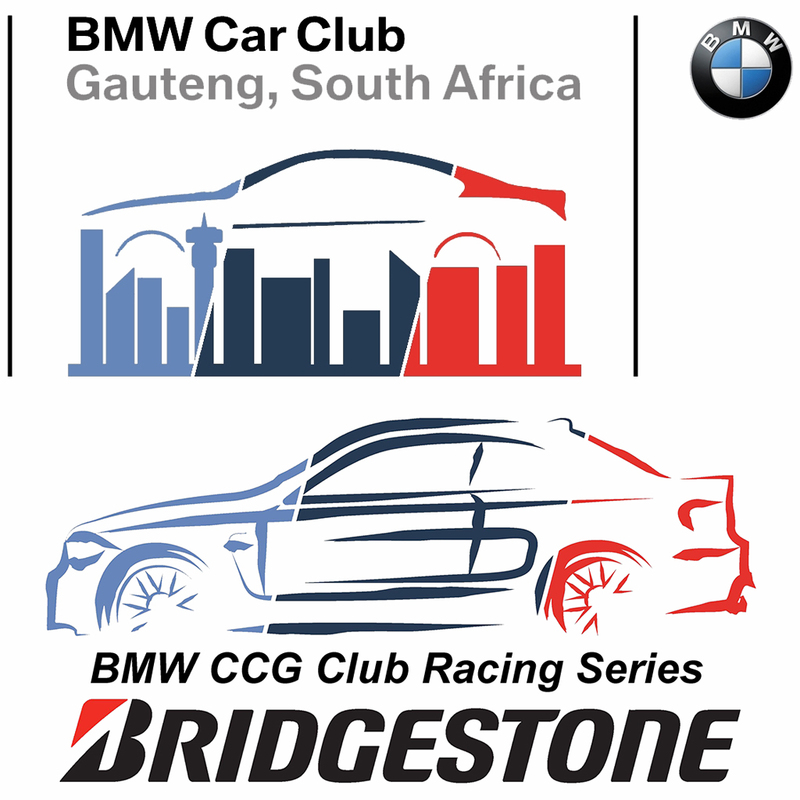 After the restart Fourie slotted into the lead and stayed there, chased to the line by Van Rooyen, Masters, Sipuka and Daniel Duminy (SMD Group BMW). 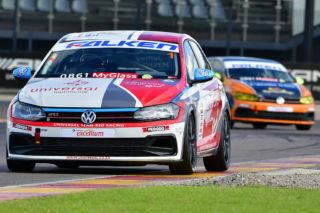 Bradley Liebenberg (Volkswagen Motorsport Golf GTI) took both the GTC2 races, with Trevor Bland (Kalex Golf GTI) and Adrian Wood (Kyocera Golf GTI) swapping the respective second and third places. 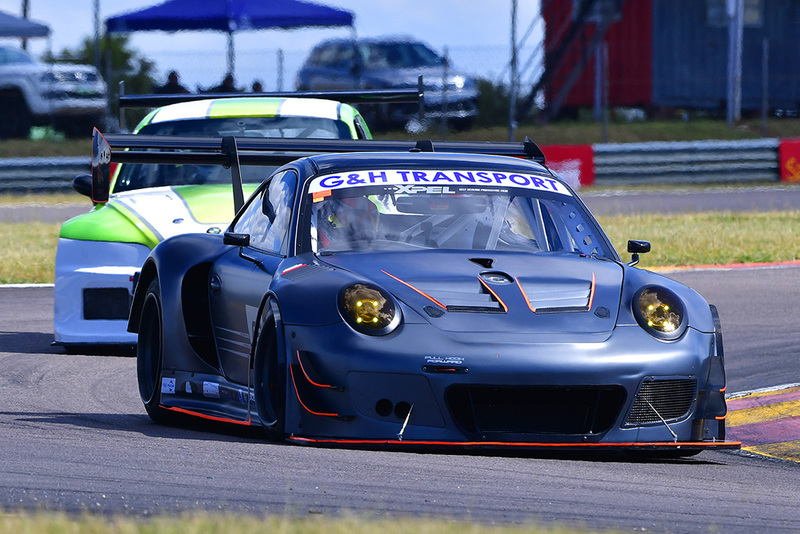 Franco Scribante (Porsche 997 Turbo) led the opening race for G&H Transport Extreme Supercars from start to finish. He was followed by Jaki Scheckter (Drizit Lamborghini Huracan), Darren Winterboer (Barons BMW M3) and Sam Hammond (Trinity Lamborghini Gallardo). Race two also went to Scribante with Scheckter second, chased by Hammond and Rick Loureiro (Combined MW 335i Turbo). Jeffrey Kruger (Universal Health Polo) stood on the podium after all of Saturday’s thee Falken Polo Cup races. Picture: Dave Ledbitter. 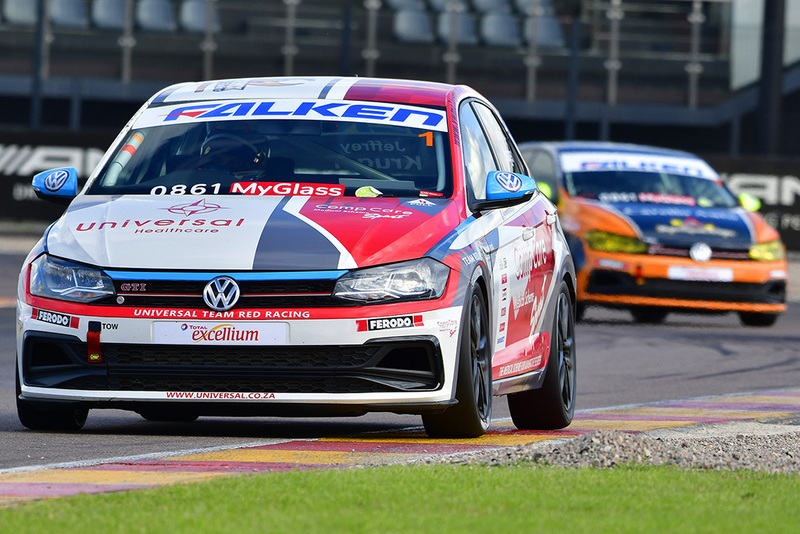 The first Falken Polo Cup race was red flagged after Stiaan Kriel got tagged at high speed and rolled his Kalex Polo down the back straight. After the restart Jeffrey Kruger (Universal Health Polo) took the victory ahead of Clinton Bezuidenhout (Glyco Engine Polo) and Bradley Liebenberg (Hello Mobile Polo). 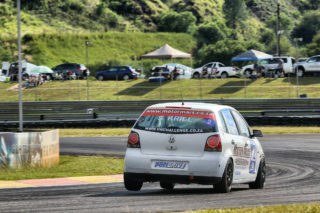 Race two also went to Kruger, leading home Jason Campos (Turn 1 Polo) and Bezuidenhout. 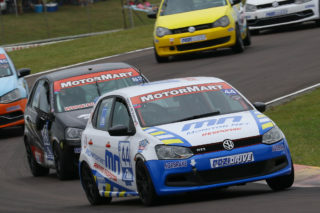 Liebenberg won race three, ahead of Kruger and Keegan Campos (Campos Transport Polo). Scott Temple (Road to Race Mygale) took the first Investchem Formula 1600 race, chased to the flag by Gerald Geldenhuys (Abacus Dicisions Mygale) and Nicolas van Weely (Magnificent Paints Van Diemen). Temple won race two as well, this time ahead of Andrew Rackstraw (Investchem Mygale) and Van Weely. Reigning Mobil 1 V8 Supercar champion Mackie Adlem’s Jaguar missed the first race due to a gearbox problem. Thomas Reib (Café 9 Chev Lumina) then led the race until the final lap, when he outbraked himself and spun in the circuit’s Tabletop section. That left an ecstatic JP Cronje (N4 Auto Corvette) to take his first category win, ahead of a recovered Reib and Roelf du Plessis (LSP Group Corvette). Adlem returned for race two, blasted through the field from the back and won, followed by Terry Wilford (Fuchs Ford Falcon) and Reib. Franco Scribante took his Porsche 997 Turbo to both the races for G&H Transport Extreme Supercars. Picture: Dave Ledbitter. Veteran Lance Isaacs (Apabets BMW RR1000) took the first race for SA 1000cc Superbikes, followed by Clinton Seller (King Price Yamaha R1) and Nicolas Grobler (Adrenaline Powersport Yamaha R1). Isaacs repeated the victory in race two. Behind him, Garrick Vlok (DCCS Yamaha R1) rode brilliantly to take the second place from Seller. Both Supersport 600 victories went to Blaze Baker (King Price Yamaha R6), followed by Kewyn Snyman (Hillbilly Yamaha YZF 600) and Jared Schultz ASAP World Yamaha YZF 600). The next round of the 2019 Extreme Festival will be a regional event, this Saturday at the Midvaal Raceway near Meyerton.